The two things Humpback whales are known for are the songs they use to communicate, which can be heard many kilometres away and their bubble feeding technique. However, it can get a little difficult to spot these beauties when all the whales seem the same to you. There are many features that help you identify one whale from another, such as their body length, presence of the nose beak, swimming characteristics, position of dorsal fin and most important of all, the shape of their blow. Occasionally, Humpback whales travel in groups of 3 or 7. They migrate from mid August to mid December. The female calves are mostly spotted travelling with calves usually standby on watch when boats approach. One of the features that will allow you to easily spot a humpback is their water-air blow. As compared to Blue whale, Minke, Killer and others, Humpback has the biggest blow. It can be seen clearly from a far and if the whales start to gather in one place, then get ready to capture the wonder. Just like the song is a call for mating, the blow is a call for food. The more fishes available in a spot, the more whales you will find there. The form a cluster around the area and consume as much as the can, around 3000 pounds. Humpbacks have long side flippers, around 15ft long. Flippering is a technique where the Humpback whale lies on its back or side and raise either one or both pectoral fins above the surface. They then strike the water with their flippers that creates a flapping sound, which can be heard both below and above the water. 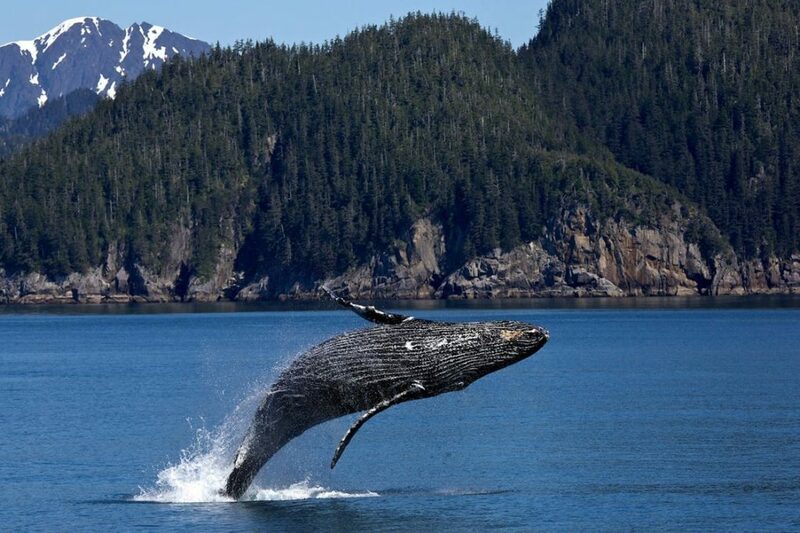 Due to their big wings, Humpbacks have been given the named “Big-winged New Englander”. This is one of the greatest features that people are after to capture. Breaching is a technique that shows the athletic prowess of Humpback whales. They dive under water and stay submerged for a few minutes, only to come to the surface vertically in speed. They twist in mid-air and hit the surface of the water causing a thunderous splash. This one feature is a regular show that you will get while whale watching. Tail breaching is the picture perfect technique that looks like the whale is playing. The whale goes underwater and with a twist, throws its entire posterior, the tail to be specific, out the water. The above picture shows the motion perfectly. Tail lobbing is a variation of tail breaching in which the Humpback whale lays on the water and thrashes its tail repeatedly on the surface. So, next time you go whale watching, look for these signs in the clusters and you will spot a Humpback whale right away!